Stanley and Sons is a wholesale nursery with one of the greatest collections of true dwarf and miniature conifers. We are committed to providing these plants to garden centers, arboretums and collectors around the world. Larry Stanley, owner, has been collecting dwarf and miniature conifers for over 30 years and is well known in the industry for his plant knowledge. 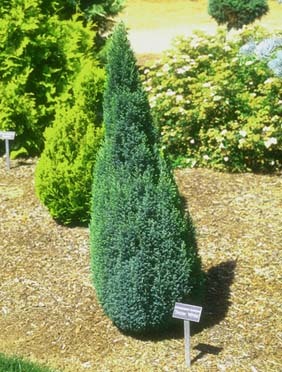 Here are just a few of the many ways to use dwarf and miniature conifers in your own gardens. See below for news and events that are happening at Stanley and Sons Nursery. To make you purchasing easy for your garden center or nursery we have created a group of buying programs that are broken down by USDA zone. These programs are built with available material which is ever changing. Use the link below to see what is currently in each collection. When you read our availability and see DR next to the product size that means that product is grafted on the Disease Resistant Root Stock. Currently have Cham lawsoniana `Blue Gem`, Cham lawsoniana `Blue Surprise`, Cham lawsoniana `Snow White`, and Cham lawsoniana `Azura` that are all in 1-gallon cans and are reaching nearly 3 feet tall. Below are just two of the many plants sold at Stanley and Sons Nursery. Now available with disease-resistant root stock. Water like any other plant in your store. 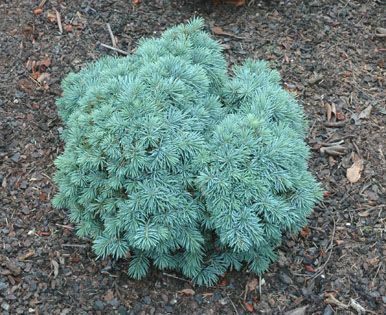 A broadly conical plant with blue juvenile foliage that is tipped with white when new growth appears.